The answer lies in using debugging tools. For a long time, most developers, including myself, have been using console.log to debug broken code. It’s quick and easy to use. However, things can get finicky at times if you don’t know where and what is causing the bug. Often you’ll find yourself laying down console.log traps all over your code to see which one will reveal the culprit. 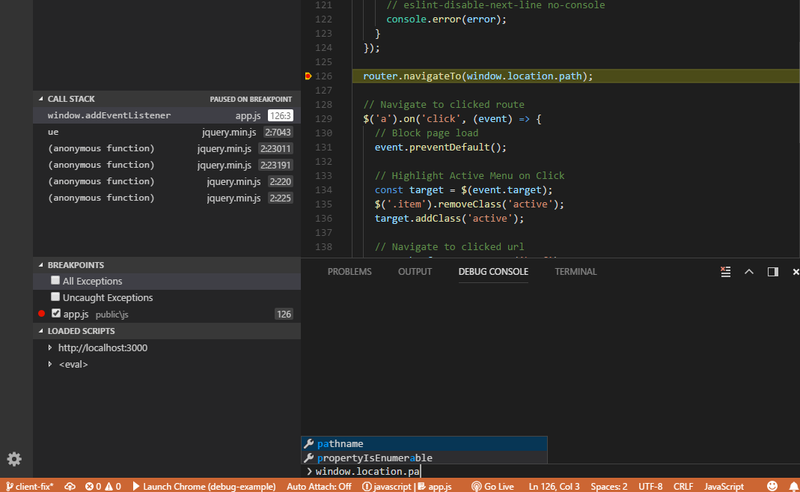 In this this article, we’ll look at how to use the debugging facilities provided by Visual Studio Code. We’ll also look at how to use the Debugger for Chrome extension that allows VS Code to integrate with Chrome Dev Tools. Once we’re finished, you’ll never want to use a console.log() again. The first file I’d like you to look at is src/places.js. 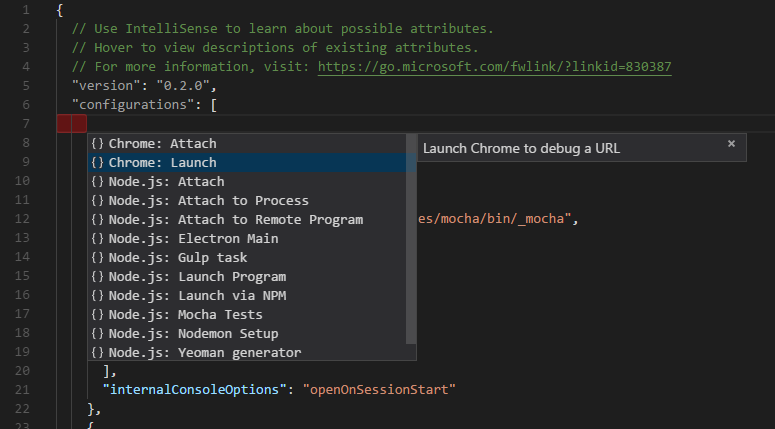 You’ll need to open the debug-project folder in VS Code (File > Open Folder) and select the file from within the editor. See the red dots on the side? Those are the breakpoints. A breakpoint is simply a visual indication telling the debugger tool where to pause execution. Next, on the action bar, click the debug button (the icon that says “No Bugs Allowed”). Note: Depending on your operating system, you might have to replace the double backslash (\\) with a single forward slash (/). click Debug > Start Debugging on the menu bar. Stop: stops the debugging session. Right now, you’ll notice that the debug session has paused on your first breakpoint. To continue the session, just hit the Continue button, which will cause execution to continue until it reaches the second breakpoint and pause again. Hitting Continue again will complete the execution and the debugging session will complete. Breakpoints: displays a list of files with breakpoints, along with their line numbers. 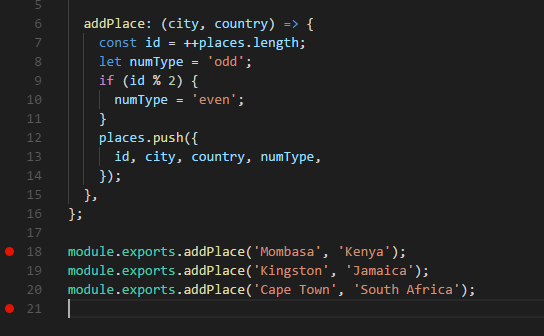 Currently the places array is empty. Press any navigation control to see how debugging works. For example, Step over will jump into the next line, while Step into will navigate to the addPlace function. Take a bit of time to get familiar with the controls. 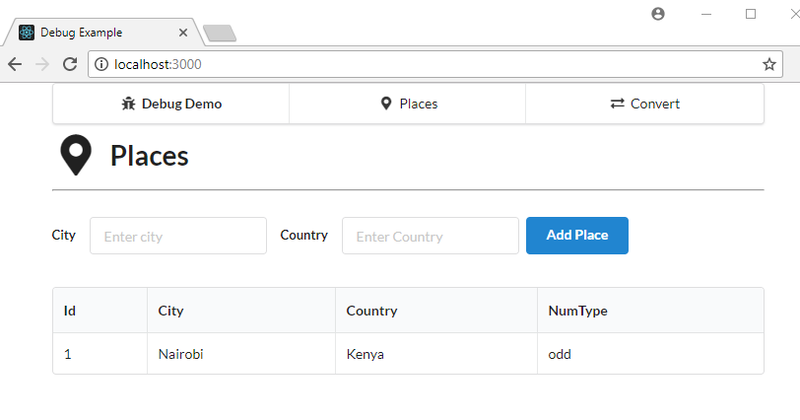 You can also inspect all variables that are in scope in the Variables section. the numType property displays even for odd id values. For now, just end the debugging session. We’ll fix them in the next section. 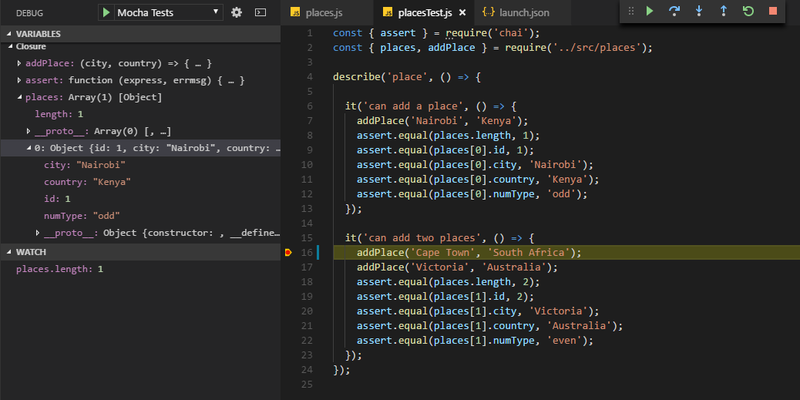 Open test/placesTest.js and review the code that’s been written to test the code in places.test. If you’ve never used Mocha before, you need to install it globally first in order to run the tests. 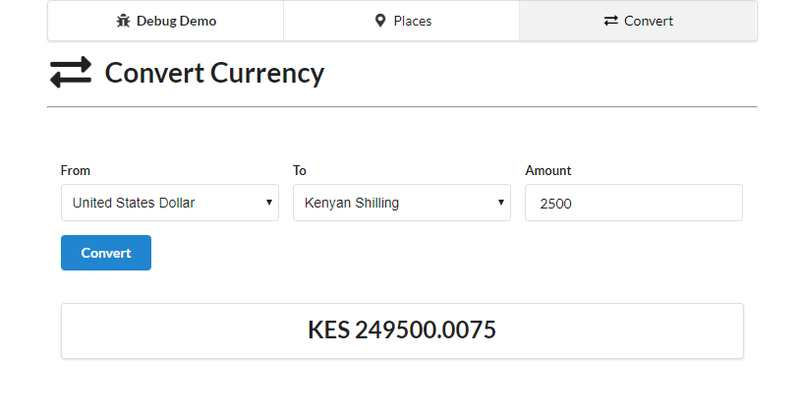 The launch.json file will open for you with a popup listing several configurations for you to choose from. Make sure to add a places.length expression in the watch section. Hit the Play button to start the debugging session. At the start of the test, places.length should read zero. If you hit Step over, places.length reads 2, yet only one place has been added. How can that be? 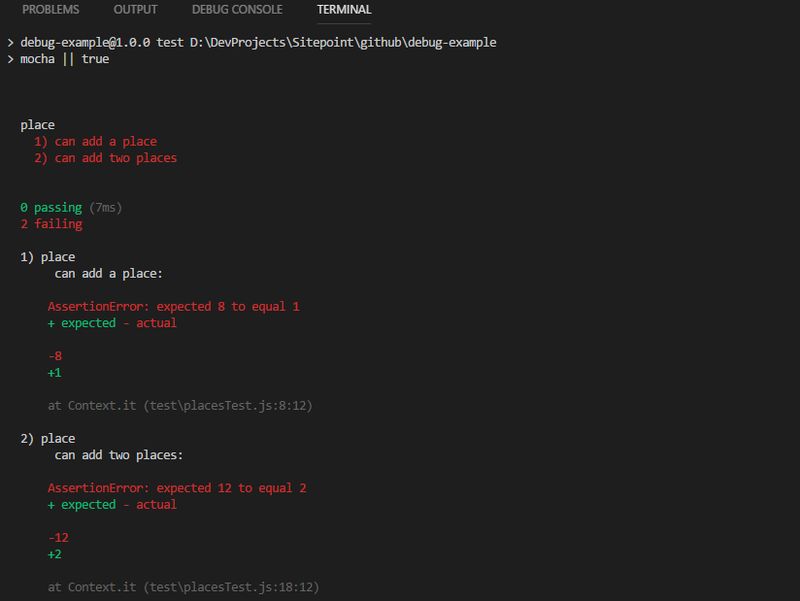 Restart the debugging session, and this time use Step into to navigate to the addPlace function. 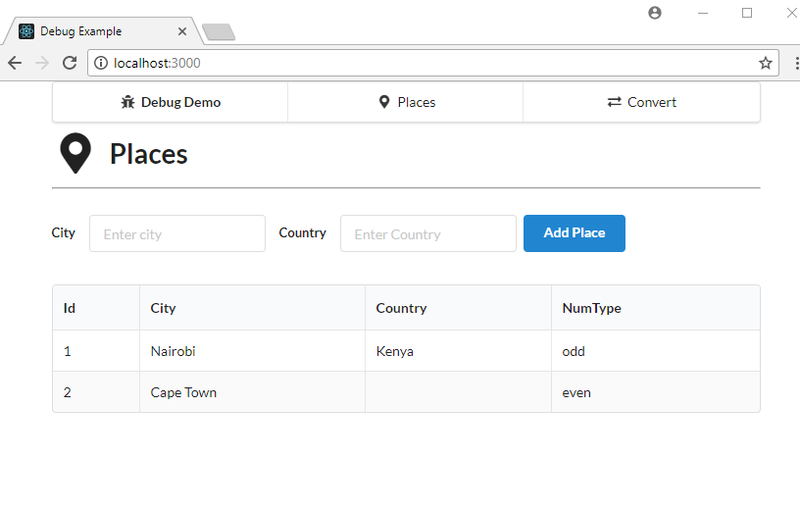 The debugger will navigate you to places.js. The value of places.length is still zero. Click Step over to execute the current line. Restart the debugger and let it pause on the breakpoint. Now the places array has a clean state. This should allow our test to run unpolluted. Just click Continue to let the rest of the test code execute. All tests are now passing. You should feel pretty awesome, since you’ve learned how to debug code without writing a single line of console.log. 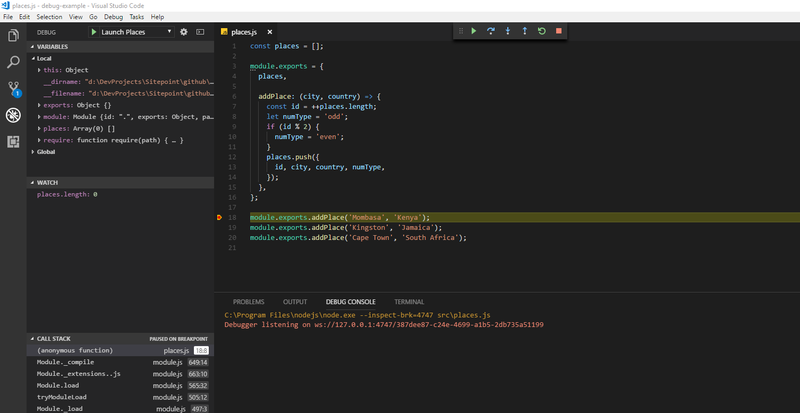 Let’s now look at how to debug client-side code using the browser. All the client-side code is in the public folder. The project’s dependencies include Semantic-UI-CSS, jQuery, Vanilla Router, Axios and Handlebars. This is what the project looks like when you run it with npm start. You’ll have to open the URL localhost:3000 in your browser to view the application. If you take a quick glance, the code will appear to be correct. So the problem must be in app.js. Open the file and analyze the code there. Below are the sections of code you should pay attention to. Take your time to read the comments in order to understand the code. Next, start the server as normal using npm start or node server. Then select Launch Chrome and start the debugging session. A new instance of Chrome will be launched in debug mode and execution should pause where you set the breakpoint. 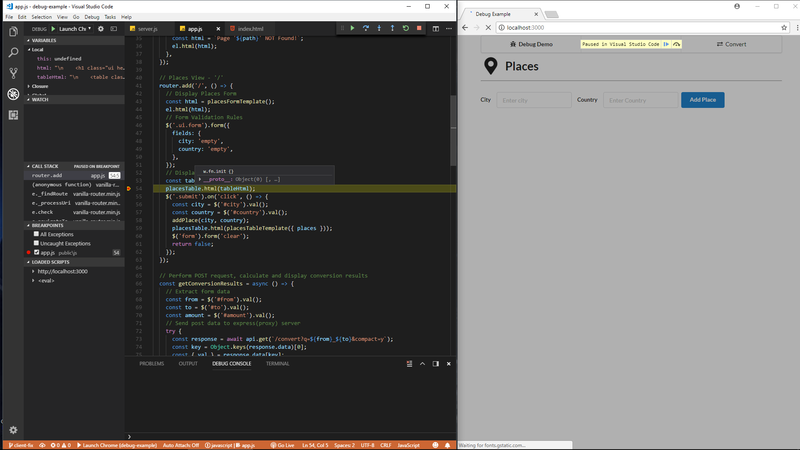 Now’s a good time to position Visual Studio Code and the Chrome instance side by side so you can work efficiently. Mouse over the placesTable constant. A popup appears, but it seems empty. 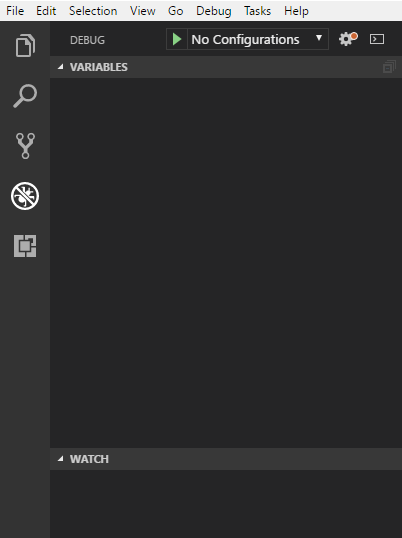 In the watch panel, add the expressions el and placesTable. Or, alternatively, just scroll up to where the constants have been declared. Notice that el is populated but placesTable is empty. 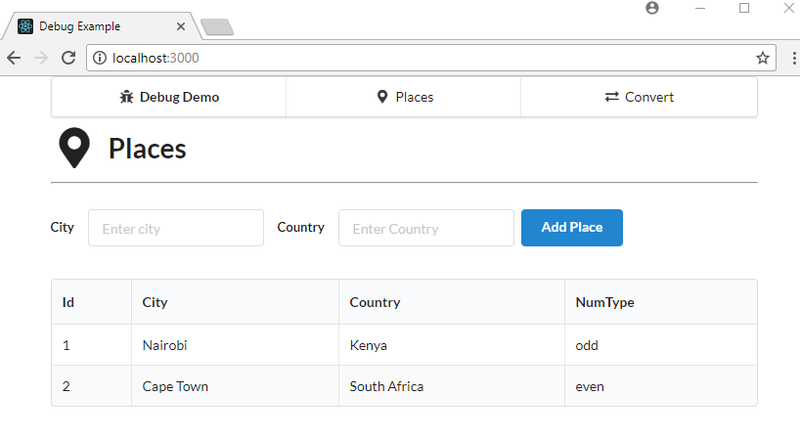 This means that jQuery was unable to find the element #places-table. Let’s go back to public/index.html and find where this #places-table is located. As you can see, the country variable is undefined, but the city variable is. If you look at the jQuery selector expressions that have been set up in the watch panel, you’ll notice that the #country selector returns nothing. This means it wasn’t present in the DOM. Head over to index.html to verify. Restart the debugging session and try to add a new place. It now works! Great job fixing another bug without console.log. Let’s now move on to our final bug. That runs fine. No bugs there. Actually there are, and they have nothing to do with the form. To spot them, refresh the page. This piece of code is supposed to route users to the correct page based on the URL provided. But why isn’t it working? Let’s add a breakpoint here, then navigate back to the /convert URL and try refreshing the page again. Hold up! The debug console just gave us the correct expression. It’s supposed to read window.location.pathname. Correct the line of code, remove the breakpoint and restart the debugging session. Navigate to the /convert URL and refresh. The page should reload the correct path. Awesome! That’s the last bug we’re going to squash, but I do recommend you keep on experimenting within the debug session. Set up new breakpoints in order to inspect other variables. For example, check out the response object in the router('/convert') function. This demonstrates how you can use a debug session to figure out the data structure returned by an API request when dealing with new REST endpoints. Now that we’ve come to the end of this tutorial, you should be proud of yourself for learning a vital skill in programming. Learning how to debug code properly will help you fix errors faster. 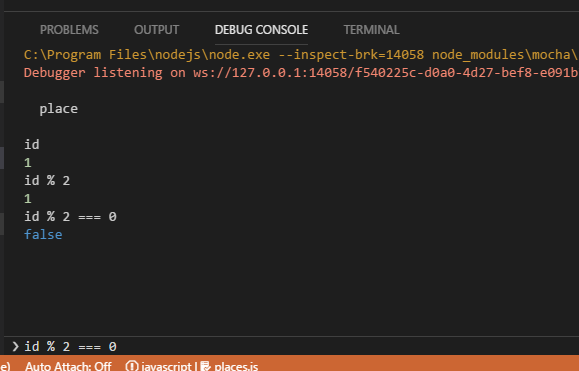 You should be aware, however, that this article only scratches the surface of what’s possible, and you should take a look at the complete debugging documentation for VS Code. Here you’ll find more details about specific commands and also types of breakpoint we haven’t covered, such as Conditional Breakpoints.